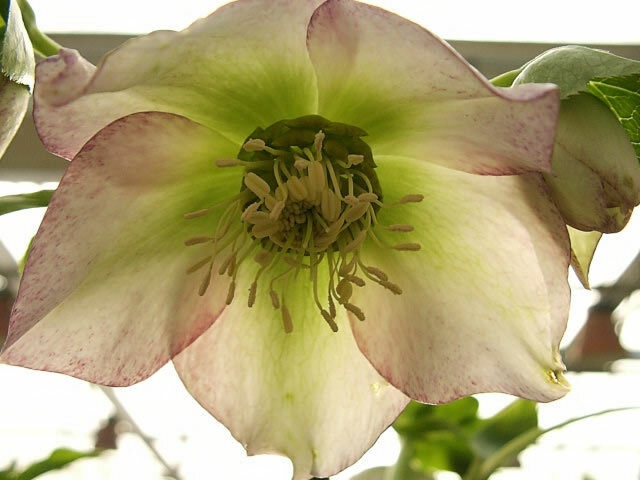 The Christmas Rose is one of the easier and most rewarding garden plants to grow, Their ability to bloom in the darkest months of the year when everything else is frozen solid make them a valuable asset to any garden. 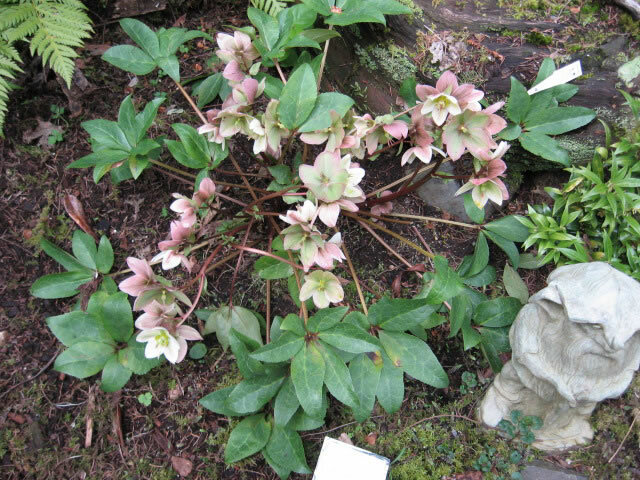 A Christmas Rose will produce flowers from late fall up until early spring. Christmas Roses are evergreen perennials that grow 12 to 15 inches tall and have shiny, dark green leathery leaves. Each flower stalk bears a single 2 to 4 inch white bloom (sometimes tinged with pink). Although these plants from southern Europe and Asia are durable and easy to grow, a few steps must be taken to ensure that these plants will flourish. 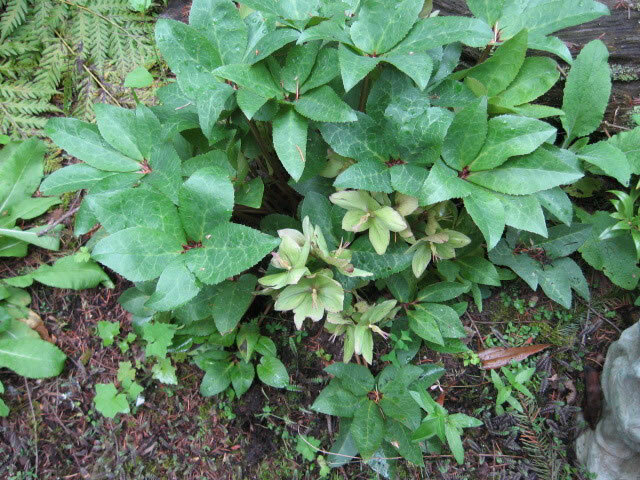 Christmas Rose plants are hardy in Zones 4-8. They should be planted in partial shade or preferably under deciduous trees, which allows them to receive sunlight in winter. Be sure to provide some protection from strong winter winds! They require deep, fertile, well draining but moist soil. The soil should be neutral or slightly alkaline and should be generously enriched with peat moss, leaf mold, or compost before planting. Christmas Roses should be planted 12"-15" apart in the garden in early spring. Christmas roses have a deep growing root system, so the roots should be planted downward, rather than spread out below the soil surface, and the crown of the plant (the point where the stem and roots intersect) should be an inch below the soil surface. Apply a one inch layer of mulch around the plant. Every spring remove old, tattered foliage and feed the plants with a balanced water soluble fertilizer with a N-P-K ratio of 10-10-10. Christmas Rose plants can be grown from seed, but it takes three or four years for them to reach flowering size. The seeds should be planted when they are fresh, because germination is much slower with dried seeds. These may be sown in pots in early fall, and kept outdoors until at least Christmas since the seed need a cold treatment to sprout. The pots can be brought indoors at this time and the seeds will sprout immediately or if left outdoors, they will sprout in late winter. It is better to start them directly into the ground in an open, protected bed or cold frame outdoors, because a period of freezing temperature (3-6 weeks) is needed for germination. The seedlings should be transplanted to their permanent site when they are about two inches tall. It takes quite a while for Christmas roses to become established, after which they should not be disturbed. According to legend, a young shepherdess named Madelon was tending her sheep one cold and wintry night. bearing gifts for the newly born Jesus. reveal a most beautiful white flower tipped with pink - the Christmas Rose.